A small church in a secluded churchyard, but we are right against the horrid A47 here which forms the main street through several villages in this part of west Norfolk. 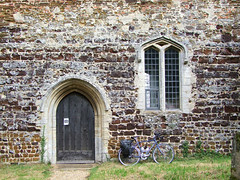 I had just taken my life in my hands cycling along it from East Winch, and I was looking forward to following the quiet lane that meanders off south of the church when I'd finished here. The Bilneys are miles apart from each other, and can never have had any connection other than that they were both called Bilney. The prefix is probably a result of 19th Century GPO bureaucracy, as a way of differentiating the two post offices, neither of which survive today, of course. St Cecilia is a small church, and it is in shipshape condition. However, this is the happy end of a traumatic adventure, for the top of the tower was wrecked in a storm in 1976. 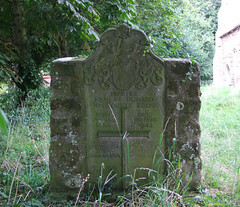 There was little grant aid in those days, and the repairs were far beyond the ability of the small congregation, so the church was closed, and the people moved in with East Winch up the road. 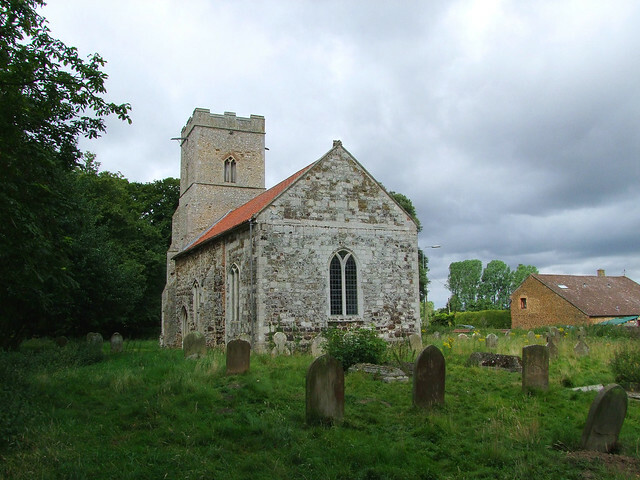 In 1983 it was decided to demolish the tower, but happily by then we had begun to have a bit of care for our old buildings, and eventually it was restored thanks to help from the Norfolk Churches Trust. The slightly odd east wall is a much earlier repair job from the 18th century, when old materials from the demolished chancel were used to create a new east end. The church remains redundant, although it appears to be in some kind of regular use, which makes it all the more annoying that the building is kept locked. There is a keyholder notice, but it was so old when I called that the farm that kept the key was no longer a farm. A passing cheery postman pointed me in the direction of where he thought the keyholder lived now (first house on the left in the direction of Pentney, if you're interested) but there was nobody in, which was a pity as I'd have liked to have seen inside.